Just like it took me forever to get around to getting these two quilted and bound, it took some time to get pictures and post them. I don't know about you, but 2013 was pretty busy up in here. This is a quilt that I got from the 2010 Spring Issue of Quilts & More. So, it took me 3 full years from start to finish! I chose colors that were a lot like the cover of the magazine, in part because it was my first finish and I wasn't really trusting in my ability to choose something else on my own. I am thrilled with how it came out and it can now be used by my family. Of course, it won't be white for long, but it will get used! The second is a pattern called Off the Rail by Jaybird Quilts. 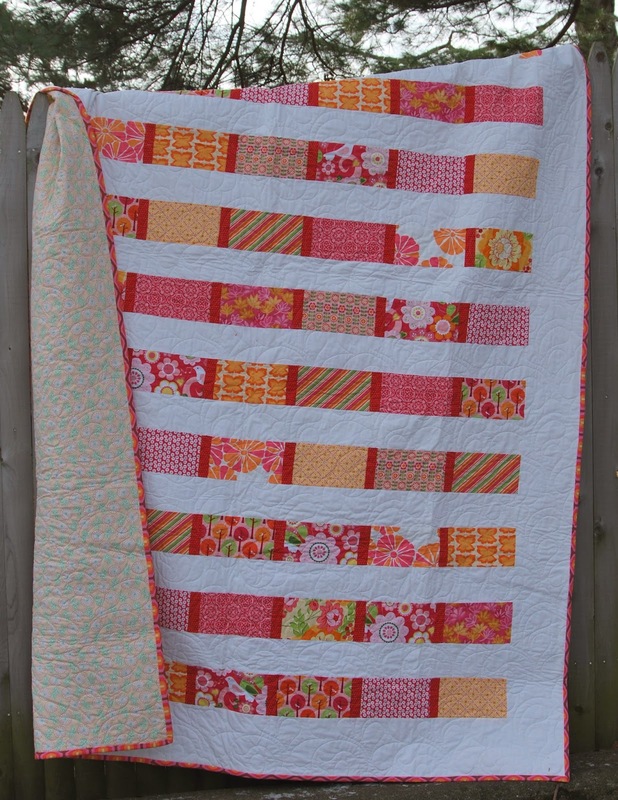 I used an Anna Griffin fat quarter bundle that I got a quilt market a few years ago and it's going to a new home. This quilt is being donated to my cousin's auction, she is raising money for her first IronMan competition. This was the first quilt that I pieced the back for instead of being all matchy-matchy and making the entire back out of one fabric. I LOVE how it came out. I'm finishing up my what I hope will be my first finish for 2014, a quilt I started a mere 9 months ago for our guest bedroom.